Just when we thought our crispy Favas and Peas couldn’t get any tastier, Balsamic Herb Favas and Peas showed up. Tossed in a tangy, savory blend of balsamic vinegar and Italian herbs, our Balsamic Herb mix really brings out the Italian roots of our fava beans. We really enjoy this mix as a salad topping for a well-needed protein crunch. 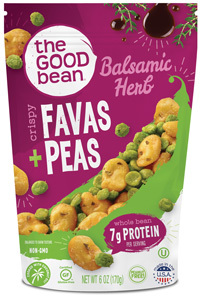 We are so proud of our newest beannovation – Favas and Peas with Coconut Oil.